Waterloo is probably the most famous battle in military history. Thousands of books have been written on the subject and yet so many mysteries remain, so much controversy abounds. This book, by presenting more than 200 previously unpublished accounts by Allied officers who fought at the battle, goes right back to primary source material. In the letters the Allied officers recount where they were and what they saw. Gareth Glover has provided background historical information but lets the officers speak for them selves as they reveal exactly what happened on the 16th, 17th and 18th June 1815. Originally sent to, and at the request of, Captain William Siborne, then in the process of building his famous model of the battle, these letters have remained unread in the Siborne papers in the British Library. 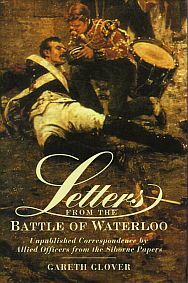 A selection of material was published by his son Herbert as Waterloo Letters in 1891, but much of vast historical significance did not see the light then and has remained inaccessible until now. Gareth Glover now presents this collection of important correspondence for the first time. There are letters here by Major Baring, George Bowles, Edward Whinyates, John Gurwood and Edward Cotton as well as letters by Hanoverian and King’s German Legion officers. This is a veritable treasure trove of new material on the battle and one which will mean that every historian’s view of the battle will need correcting. Anyone who claims to be seriously interested in the campaign and the Battle of Waterloo must have this book in their library. The result is an extraordinarily valuable contribution to our understanding of the battle.